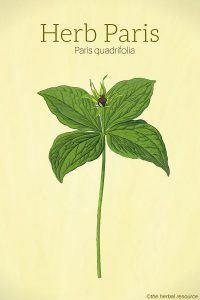 Botanical Name of Herb Paris: Paris quadrifolia. In Chinese herbal medicine, the species Paris Polyphylla and Paris quadrifolia are used in similar fashion. Other Common Names: One berry, true love, Einbeere (German), parisette à quatre feuilles (French), uva de raposa (Spanish), ferlaufasmári (Icelandic), firblad, (Danish), sudenmarja (Finnish), ormbär (Swedish), zhow sho (Chinese) – refers to both Paris quadrifolia and Paris polyphylla. Habitat: Herb paris is native to North and Central Europe, and to some parts of northern Asia. The plant prefers moldy, base-rich soils and grows best in damp shaded areas. It is commonly found in deciduous and coniferous forests. Plant Description: Herb paris is a perennial plant and a member of Trilliaceae family that includes a small group of flowering plants. 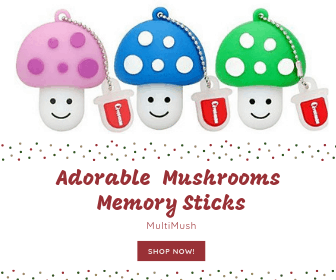 It can grow up to 10-40 cm in height and has a long creeping root-stock. The stalk is erect with normally four egg-shaped leaves that form a circle around the upper part, the number of leaves can vary between two and six, four and five leaves are most common. A single greenish-yellow flower appears from May to June with four lanceolate sepals and four narrow, pointy petals. The fruit is a large, blue-black berry that resembles a blueberry or bilberry. The plant has an odor not unlike rotting flesh and all parts of it are poisonous. Pollination is accomplished by wind or carrion flies that are attracted by the smell. Paris herb is easily identified and hard to mistake for other plant species. Plant Parts Used: The whole plant has been used in herbal medicine, but most commonly the rhizomes, leaves, and berries. Active Ingredients and Substances: The plant’s main active substances are saponins. It also contains paristyphnin, alpha paristyphnin, paridin, paradol, L-asparagine, diosgenin glycoside, pectin and citric acid. Herb paris has been used as a medicinal plant as far back as ancient Greece and the Italian physician and botanist Matthiolus (Pietro Andrea Mattioli 1500-1577) referred to it as a good remedy against boils. As a treatment for neck abscesses, the root was either eaten raw or a tincture was made from the berries that were then brushed on the affected area or used as a gargle. In folk medicine, the leaves were once used as a compress on ulcers and slow healing wounds and the berries were used to expel bedbugs. In the past, the herb was also used to treat rabies (hydrophobia), and the berries were used as a remedy against the plague. In some places in Russia, the leaves were prescribed for insanity. Probably because the plant has some narcotic effect. Today, herb paris is not used much in herbal medicine and then mainly as an homeopathic remedy. Still, it has been used as an aphrodisiac which could be explained by the narcotic effect of the berries and seeds, the effect is not unlike that of opium. However, the dose needed to experience any narcotic high will at the same time cause nausea, vomiting, dizziness, cramps, excessive sweating and dry throat. Herb paris should always be used with great caution, as an overdose can be fatal. The leaves and berries have been administered as an allopathic medicine, a method of treating ailments by the use of agents that produce effects different from those of the disease treated. As such it has been used as an antispasmodic remedy for pertussis (whooping cough) and various types of epilepsy. Again, this must be done with great caution because of the plant’s toxicity. In small doses the leaves of herb paris are though to be useful as an herbal treatment for bronchitis, spasmodic cough, rheumatism, colic and palpitations. The plant has also been used to treat headaches and neuralgia, and the juice from the fresh berries are said to be helpful for inflammation of the eyes. A cooling liniment can be made from the seeds or the juice from the leaves and used on fresh wounds, cuts, and scrapes and as a topical application for swellings and inflammation. Scientific information on suitable doses of herb paris is lacking and probably depends on the user’s health, age and several other factors. This herb should not be used for self-medication and when or if it is intended as herbal medicine it is best to contact a trained herbalist or a professional health care provider knowledgeable on medicinal herbs. The leaves, berries, and root can have a toxic effect when consumed, especially in large quantities. The plant sap can cause skin irritation in some people. 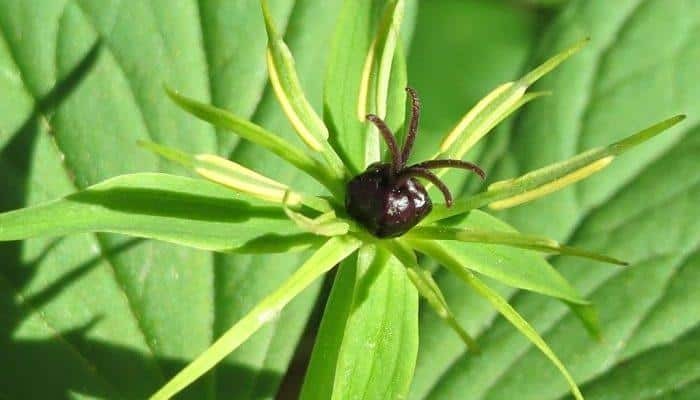 Herb Paris Poisoning: It is the substances paristyphnin and paridin which are the cause of the herb’s toxicity. These two substances are found in all parts of the plant with the highest concentration found in the root and berries. Information on how many of the plant’s berries can be ingested before they become dangerous is somewhat inconsistent. Some sources say four or five while others say 30 to 40. Cases of poisoning are known to happen and at least one case of fatality has been confirmed. It is mostly children that suffer from paris herb poisoning and usually because they confuse the berries with blueberries or bilberries but since each plant produces only one berry the risk of serious poisoning is small. In addition, the berries do not have a very agreeable taste. Poisoning symptoms start with nausea and retching followed by colic, diarrhea, painful cramps and difficulty in breathing. If fewer than five berries are consumed, a treatment is rarely needed as the symptoms gradually disappear by themselves but if in doubt, a hospital or healthcare provider should be contacted immediately. A treatment can consist of stomach flushing, enhancing blood circulation, assistance with breathing and ingestion of activated charcoal, anti-convulsants and / or sedatives. Hamilton, Edward: Flora Homøopathica. New Delhi, India, B. Jain Publishers Pvt. Ltd. 1921 / 1995. Langer, Torben W.: Giftige planter. København, Lademanns Forlagsaktieselskab 1987.